Plaster portrait relief of Jack Ryder. 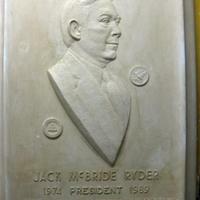 Text on the mold is "Jack McBride Ryder 1974 - 1989 President Saginaw Valley State Universisty". Bronze portrait relief of Jack Ryder. 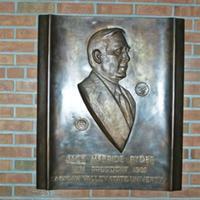 Text on the relief is "Jakc McBride Ryder 1974 President 1989 Saginaw Valley State Universisty".